Why are my superbells dying? Why are my superbells dying? I water them every other day…they always seem to be dry? 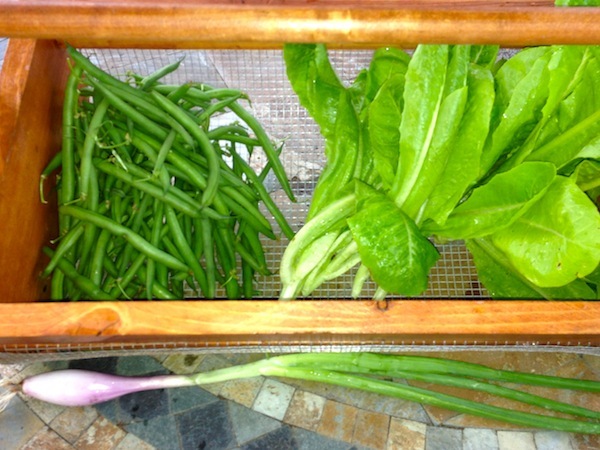 They are in a hanging container that lets them drain well. I live in California and they receive full sun all day. Hardy and steady blooming plus these bloomers are self-cleaning. Photo by Patsy Bell Hobson. My gardening friend, this is what I think. Of course, I can’t see the problem, but my guess is that your container is too small or you should add some organic matter to the soil. Something like peat moss, core, grass clippings, shredded news paper. In CA, you should not have to water every other day. A. Too many plants in too small of a space. B. poor quality soil mix. C. You need a better and probably a bigger basket. Don’t give up on the Superbells, I have some that have overwinter and lived to bloom another year. They serve me well when other flowers are suffering the summer heat. Organic Container Mix from Gardeners Supply loaded with peat moss, perlite. 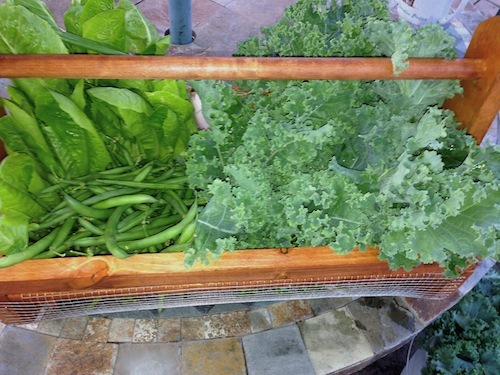 They also have a self watering variety that might solve your problem. I am a great believer in starting with a good base of moisture holding, well draining potting soil.In my gardens I’m replacing peat with core. It’s cheaper, more readily available and a good environmental choice. Watermelon slice was a butterfly magnet last spring. Photo PBH. My advice is to start all over. Using the plants you have. Giving then a better or bigger root space will allow them to thrive. Please let me know of your success and how you solved the problem. Becky, You made a good choice. Superbells are a favorite summer anual. I suggest you give it plenty of water. Even if the plant was well watered the surrounding dry soil will wick off the moisture. A newly planted flower has yet to establish it’s root system. It needs extra water and attention for a few days until it is well rooted in it’s new home. The Yard Boy did everything right, in fact, he deserves many tall, iced drinks. Because we had such a mild winter, these Superbells survied the winter and are blooming again this year. I’m growing more superbells this year.There is a new bright yellow and white striped superbell coming. Next spring, look for ‘Lemon Slice’ at the garden centers. 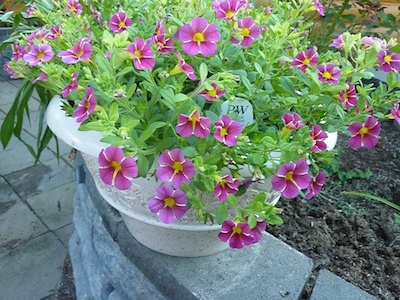 This year, I’m growing containers of mixed annuals. It is a test, to see if I can keep these full sun flowers well watered and blooming. Superbells are a Calibrachoa. This new type of plants looks like little Petunias. They are related. 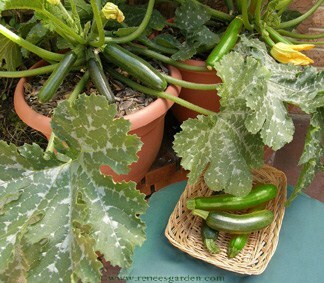 Plants in containers live or die because we remember to water and fertilize. I love that you dont have to deadhead old flowers or pinch back stems. Once established, water only when the top of the soil feels dry. Too much water makes roots rot. Full sun. Fertilize once a month. Only 6 – 10 inches tall, these long, trailing branches cascade over the sides of hanging baskets and containers, or spread over flower beds. These superbells are hummingbird magnets. 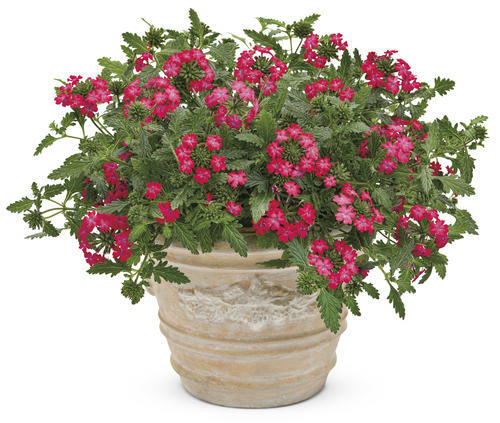 Verbena are easy care choices for containers and hanging baskets. 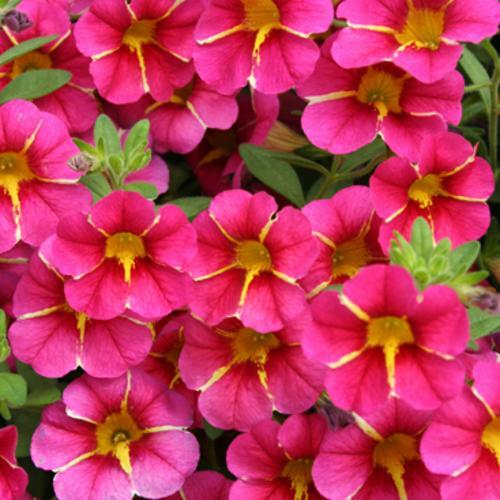 If you are looking for a pop of color that will last all season, consider these bright annuals. Last spring, Proven Winners sent these two Superbena verbena hybrids to me for evaluation. This spring they are on the market and easy to find. What I enjoyed was the low maintenance, easy care plants that just seemed to thrive in the full sun and summer heat. I planted these verbena in hanging baskets. They would be a good choice for a low growing pop of color in a flower bed or container. Talk about easy care, these Superbena do not need deadheading, no trimming or pinching. Container plants are always dependent on us for water and I did regularly water them. My plants were in full sun all day with only slight shade in the late afternoon. They were a good choice for the patio, bold, nonfading flowers that attract butterfies. There was no sign of pests or disease. What could be better? I would grow these Proven Winners Superbena hybrids again. They were a great choice for my humid, zone 6A, Southwest Missouri garden. By the way, the Proven Winners site also has a tab showing Closest Proven Winners retailers (on the left side of the screen.) It sure makes it handy for finding and supporting local, independent retailers, the folks who are our neighbors. These are the knowledgable experts with practical hands-on experience and the best advice. These faithful flowers come in several colors. 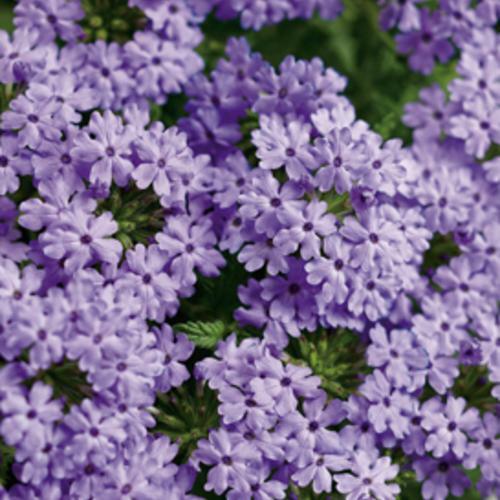 One that caught my attention is this lavender Superbena® Royale Silverdust Verbena hybrid. See all your color choices at the PW site. 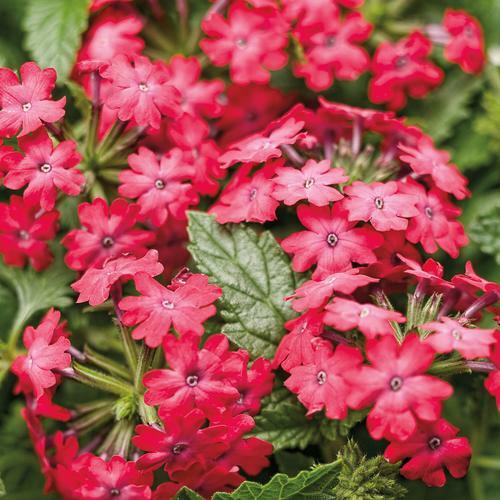 Click here or just type in the name Superbena Royale Iced Cherry Verbena hybrid. 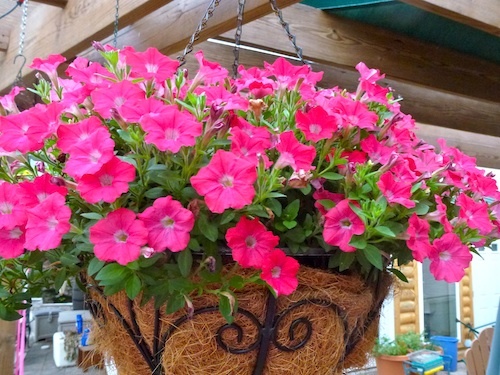 Calibrachoas are related to petunias. But they are a new type of plant that can take the fierce drought and continue blooming through the first light frosts of early fall. Hundreds of continuous blooms were visited daily by the humingbirds. If these sweet flowers sound familiar, I couldn’t wait to tell you about them this past summer. A First Look. The bright little trumpets were tumbling over the side of the the container. 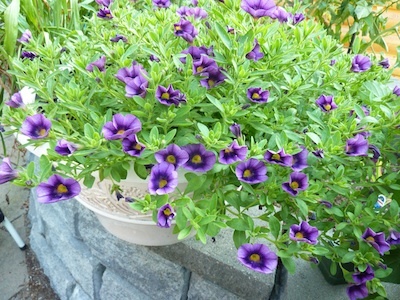 This summer, I’m going to plant Superbells in hanging baskets because these are bright, attention getting colors. Hummers and butterflies love them. And here is an interesting observation. 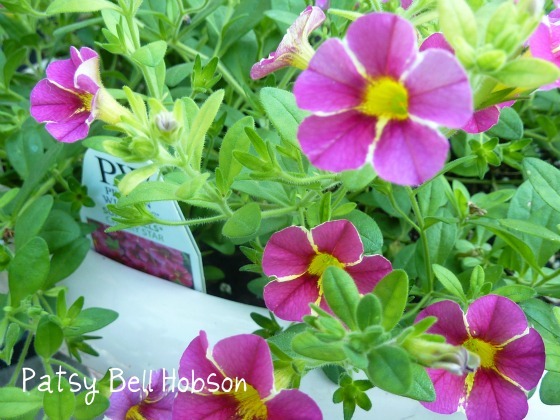 These Superbells® Calibrachoa are still alive and green. The containers are sitting on my patio. Perhaps they will be as beautiful this summer as last. I’ll keep you posted. Proven Winners sent these Superbells to me as a trial last summer. They will be in the garden centers this spring. The colors are intense, fadeproof, and do not need to be deadheaded. These little bells are fuss free. I like that you can find local retailers on their web site. Just type in your zip code find out where to buy this plant. The Biggest Success in my garden last year was Dragon Wing™ Red Begonia. I have these begonia plants in a big 14” hanging basket. It took a couple of weeks and the basket was ablaze with pure red flowers. They bloomed all summer giving the patio a big burst of color. 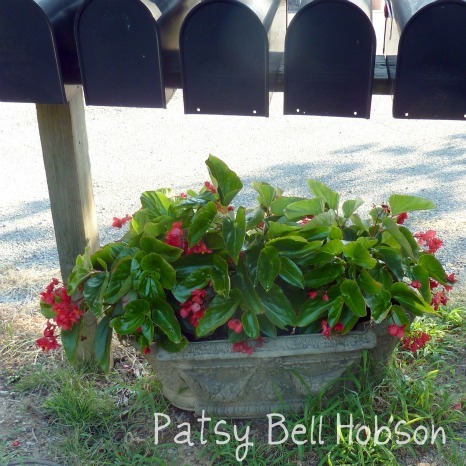 These exotic looking Begonias have loose clusters of Red stop-and-look-at-me blooms. Glossy green, wing-shaped leaves support the beautiful Chinese red flowers. My plants are healthy and thriving in a full sun environment, but they will take part shade. Everybody looks better and does better with a little afternoon shade in summer, including begonias. This trial plant has made me a convert. I am now a great fan of begonias thanks to Dragon Wing Red Begonia. You should know, if a plant survives the summer at my house, it must be hardy and thrive on neglect. Sure I plant them (home of the famous $10 hole for the $5 plant) and irregularly water. I fertilized these plants once during the summer. Last summer was hell on most plants. Even the tomatoes stopped producing. Much to my delight, the Dragon Wing™ Red Begonia was non stop blooms all summer. 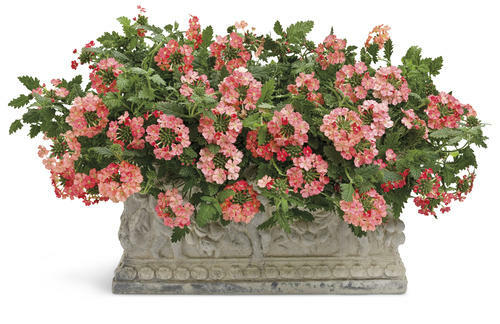 Thanks to Dragon Wing™ Red Begonias, there were always a lot of flowers but no deadheading is needed. The mail box planter is in the full sun all day. They are bright, beautiful, and attracting attention with their red floppy flowers. These Dragon Wings are thriving on the heat and humidity of my zone 6a southeast MO patio and mailbox planter. Ball Horticulture sent this plant to me for evaluation last spring. Dragon Wings are a no fuss, low maintenance plant. 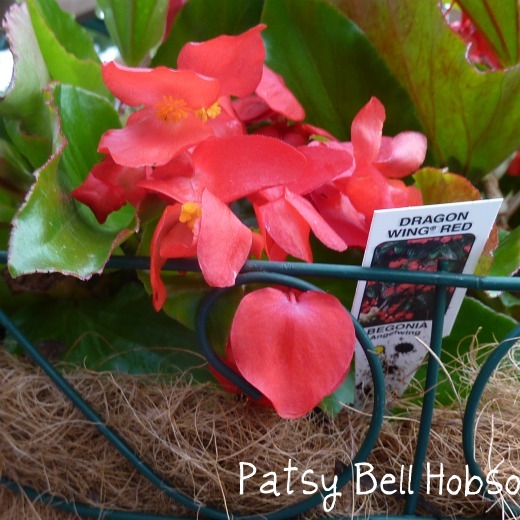 I would use Dragon Wing Begonias again as an informal bedding or border plant. It’s one of the prettiest begonias I’ve seen. Marigolds are always in my garden. Every year Marigolds are included in the flower garden border. Faithful bloomers, even during the hottest of summer. Brilliant hot colors stretch into some of the last colors of the season. Ball Horticulture sent this plant for trial last spring and I was happy to see it. 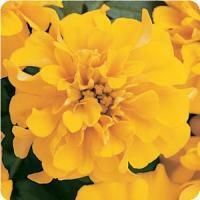 Marigolds are drought tolerant, sturdy plants that need little care. It grew to about 10 inches tall, making a color splash where ever it is planted. 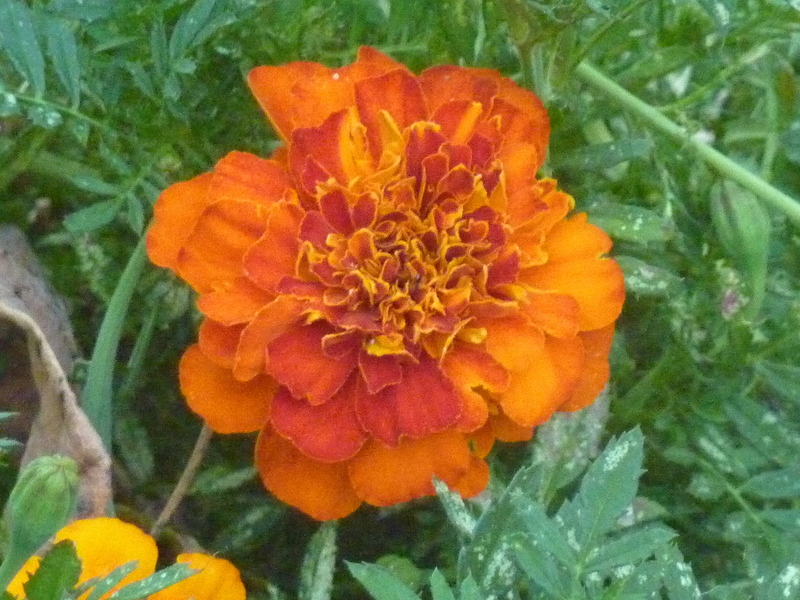 I’m not nuts about the fragrance of marigolds but I love their looks and the coninus blooms all summer. This plant is a season stretching annual, bloomimg nonstop until we get that hard frost some time in October or November. Look for the mix of yellow, gold-red, and bicolor flowers. The double crested flowers are one of the largest marigold flowers that I’ve grown. 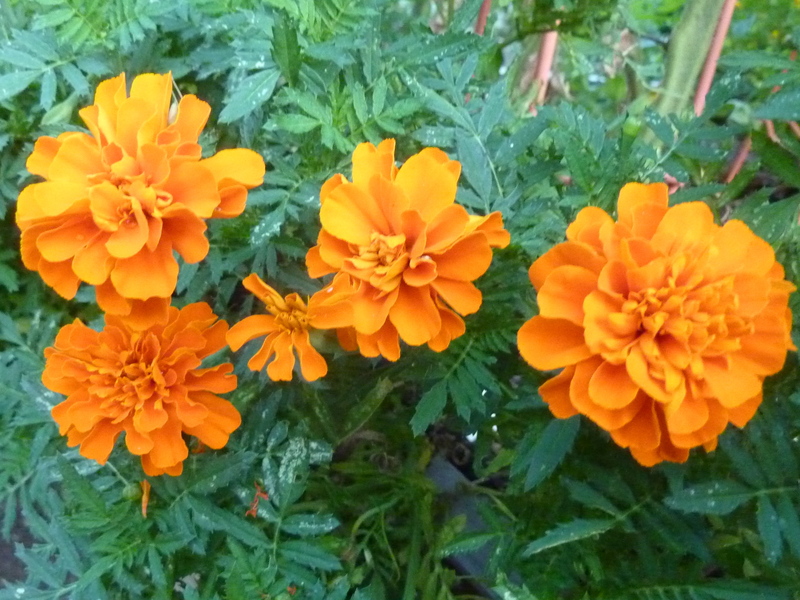 These marigolds did not have any insect or disease problems. 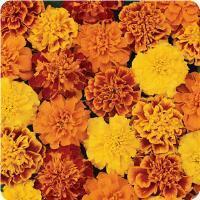 This Bonanza Deep Orange Marigold has bright, intense color, required little water and minimal fertilizer. The mounded green plants faithfuly bloom throughout the summer drought. It takes a hard freeze to kill them. Look for the plants or the seed. I can never have too many marigolds. 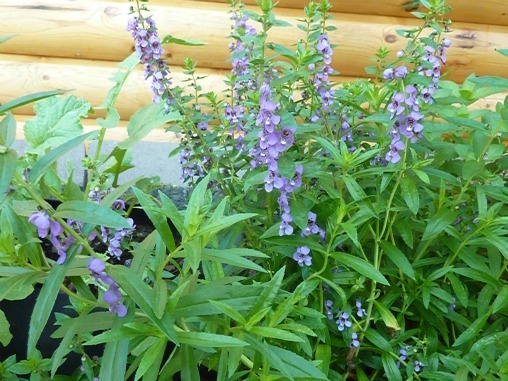 (Angelonia angustifolia) is some times called Summer Snapdragon. This sweet blue flower bloomed late spring, all summer and until frost. 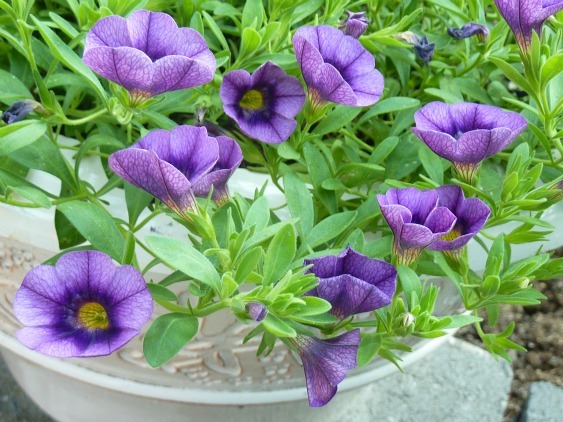 No matter where you plant it, this perky upright flower is drought tolerant, heat tolerant and low maintenance. Honestly, this plant received no extra attention. I did not fertilize the angelonia all season. It did receive occasional watering during a long summer of drought. 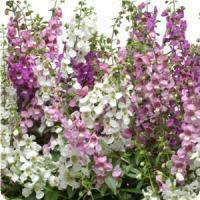 I can only imagine how beautiful the angelonia would be with a little attention, regular watering and fertilizer. The plants reached over a foot tall with bright green foliage and narrow leaves. I planted this Ball trial in a raised bed in full sun. The plant grew to just over a foot tall and at least that wide. 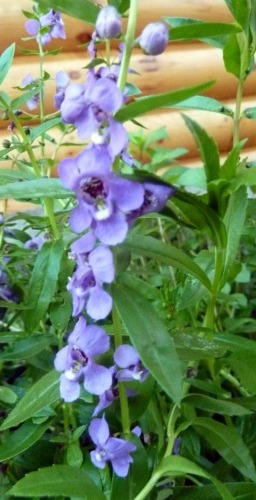 Blooming nonstop all season, Angelonia needs no pinching or deadheading. This Serena® Blue Angelonia is a clear blue upright continuous bloomer. Two more new varieties, Serena Waterfall Mixture Angelonia and Serena Mixture Improved Angelonia are beautiful color combinations. Also in this series are lavender, purple and white. Serena® angelonia blue was a trial plant sent to me by Ball Horticultural Company for evaluation. 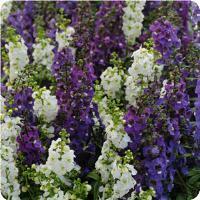 Angelonia is much hardier than the delicate looking blooms and foliage appear. It is truly care free. There was no hint of disease or insect damage. I love the non fade blue color that was not phased by last summers extreme heat. I would buy this plant again and would recommend it to my friends.